Do ü have a hard time deciding which flavürs to swirl in your cup because you want a bit of it all but don’t want it to mix? No problem! New Ü Divide, frozen yogurt dividers are now available in stores for you to have even more fün making ür cup. Add one to your cup and follow the easy steps to create up to 4 different frozen yogurt masterpieces all in one cup! So go ahead, have your strawberry, vanilla, chocolates, and sorbets just the way you like it! 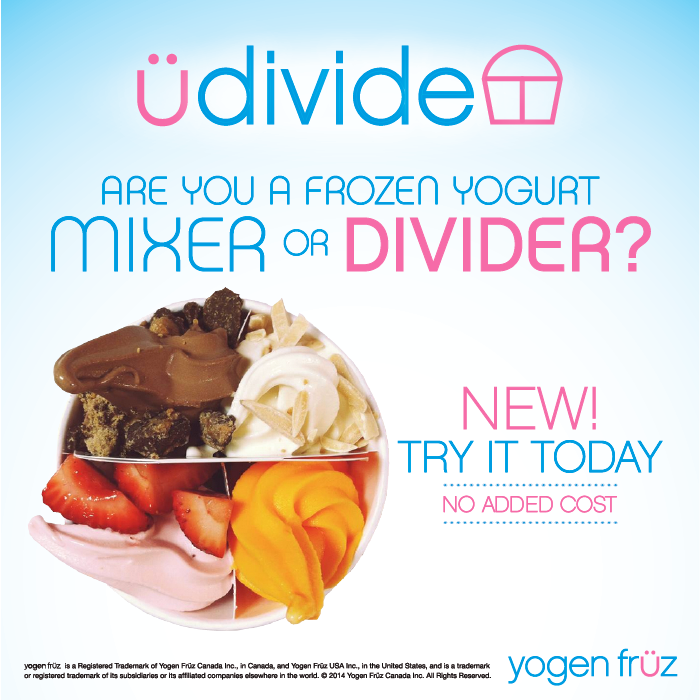 Ü Divide frozen yogurt dividers are now available in stores at no extra charge. Ask in stores for more details. Click here to find a store near you.